People often ask me what to pack when coming to Paris? I never know what to answer as the weather is always very unpredictable... Hence last April and May, when we suffered an unusual and terrible drought and now July which is really windy, rainy and a little cold too (and probably not good for business). 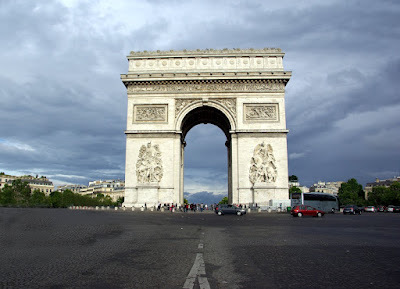 Only positive point: nice weather to take pictures ;-) Need I introduce you to the Arc de Triomphe? I did not think so! I always love to see all the tiny people on top! It really gives perspective to how huge the Arc is. Love the photo - very dramatic sky! A little cold sounds so great! It is 99 (F) degree here today and very humid! We've been living this for two days with two more to come. Awful! Hope the sun finds you soon. Very nice perspective of the arch. Most of the USA is the opposite of France these days (surprise!). We are having a heat wave. You've definitely made the most of the weather, mon ami—and your most famous perspective! Wow, where is everybody?!! No traffic?!!!!! Wow. It might be good to visit when the weather's not so great--fewer crowds. Not many vehicles zooming! Must've gone south for the summer. 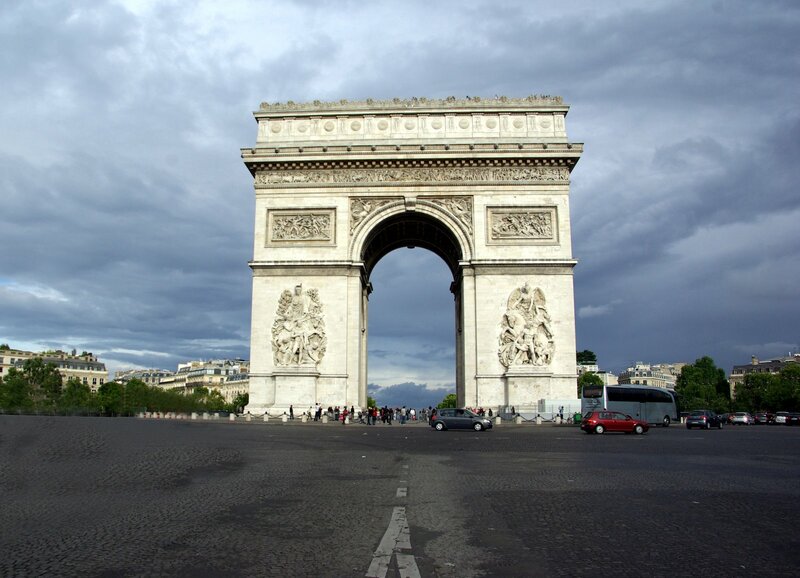 Eric, did You take this shot from the Champs-Elysées avenue or from the Grande Armée avenue? I must admit I could not be sure of which side it is ... Shame on me! Anyway I love the picture with that sky : you are right, the weather is still good for you, the photographer ;) But today it is going to rain all the day. Cameras do not like rain, I think! In my experience the only predictable thing about the Paris weather is its unpredictably. It's the same in the UK, that's why the weather is our favourite topic of conversation! When in Paris, pack a mac. @Mpls Loves Paris, @Jack "It is 99 (F) degree here today and very humid!" Yes, in was in our news tonight. Apparently it's very hot in Central US at the moment and it's moving towards the East. Can you send us some?! @Darcy Moore I love your Notre Dame photo (an little "enhanced" is it?! I see you saw the flowery car too! @Christie " but quite pleasant when I head to the lake every morning to kayak! :)" You bet! @Drummond "that's why the weather is our favourite topic of conversation!" Exactly! What do people who live on the Equator talk about?! What's a Mac BTW? @A. "I love this shot and your humor Drummond : 'when in Paris, pack a mac'. LOL " I wish I could laugh too!! What a beautiful sky! Here in Albuquerque we would gladly trade you our hot, bright weather for some of that rain. It has not rained here for over 200 days. @ Eric, lol !! Non mais j'aurais bien voulu savoir si tu avais pris la photo côté Champs ou côté Grande armée ! Puisque tu ne veux pas répondre (j'ai bien compris), je parie que c'était pris depuis les Champs ... Verdict ? A côté de la plaque ^-^ ?! @Flore. Non, non c'est du côté Grande armée/ C'est vrai qu'on ne peut pas savoir en fait. Eric, a 'Mac' is a computer - not necessary for the weather, but a 'mac' is short for a macintosh - otherwise known as... a raincoat! Did I get that right, Drummond? PS - I don't know why they're called macintoshes, BTW! @ Carrie - just posted a message and my net went down! Its called a mac after the inventor - Charles Macintosh (like Sandwich and Wellington!). Originally a rubberised material but now applies to almost anything waterproof. Have friends from Florida visiting in August - via Dublin! And we go on to Paris. My advice to them - lots of layers, waterproofs and an umbrella! INSTALLING SUMMER..... ███████████████░░░░░░░░░░░░░░ 44% DONE. Installation Failed. 404 Error: Season Not Found.